Ms. Weaver's Room - What's happening? UGGGHHHH! Each year my goal is to keep families updated by posting here, but I keep falling back into the rut of sending paper notes homes. This is because in my mind I think it is easier for parents to read a note that is handed to them rather than having to check out my website. However, I am finding that some notes are not making their way into your hands. I also know that with today's phones and tablets, checking the internet is much easier. So this is where I will be posting most information for our classroom. I will have the students write "check weebly" in their planners when I have added information. If you are checking grades and wonder why your child's math grade went down (if it did), it is because I included the Two Minute Timing Division tests. If your child has not reached his/her goal and received a hundred percent on this, then he/she needs to be studying math facts nightly. Please look at and sign your child's planner nightly. This is a way for you to know what is happening in class, for us to communicate, and for you to know whether your child has homework. Parent/Teacher Conferences will be held Monday, October 10, from 12-3 pm and 4-6 pm. I will send a progress report on Monday, October 3. Please fill out the form below and return it to me by Friday, October 7, 2016, or you may email your information to trisha.weaver@pittsfordk12.org. If you have any questions, please call my extension 304 (not the main office) or email me. Please remember, we do have a half day of school on the 10th. Also, I post information about our class on my webpage www.msweaver5.weebly.com Please check it for information. _____ I would like to schedule a conference with you on Monday, October 10th between 12-3 or 4-6. _____ I would like to schedule a phone conference with you. _____I would like to schedule a conference with you (choose one) before or after school during the week of October 10th. _____ I don’t feel that I need a conference at this time. I sent a letter home this week with information regarding several items, including a possible trip to Chicago. If you have not sent the form at the bottom of this letter back to school, please do so by Friday. Because of our schedule, students eat breakfast first thing in the morning and are finished by 7:55. I know in the past, breakfast has been a bit later. However, we are working or at specials by 7:56. It is very important that students are at school on time. I would like to thank the Parents' Club for all they do for us. Over the years, I have asked for several grants to purchase books. The latest book purchased for our class was Tell Me by Joan Bauer. Below, you will find students' explanations of why they enjoy the novels we have read. Just a reminder... Chicago trip payments for December have been mailed. If you missed the deadline for the December payment, please go ahead and mail it to Corporate Travel as our payment already went out. It is hard to believe it is October already! Parent-Teacher Conferences are October 12. Please send your form in ASAP. We finished the novel A Handful of Stars last week. Today we started watching McFarland USA. It is a great movie that gives kids an idea of what life if for migrant workers, especially those who trying to work and go to school. The theme is similar in both the movie and novel. Don't forget, Sunday, October 4, there is a Be the Match Event at the school. We are hoping to find a bone marrow donor for Karrie Hughes. If you questions about Be the Match, go to bethematch.org. If you are able, please consider be added to the donor list. You could save a life. Students will bring slips home about Parent Teacher Conferences, which are being held October 12. Time is limited, so please return ASAP. If you would like to meet another day, there is a place to indicate that. I am also available for phone and email conferences. Please note: Students are required to earn 5 AR points by the end of the marking period, 11/6/15. If they do not complete this, it will affect their English Language Arts grade. We read and discussed a book about Malala Yousafzai. Students will complete a writing assignment on the information from the book. If you would like to learn more about her life and campaign for education, please click the link on the resources page. 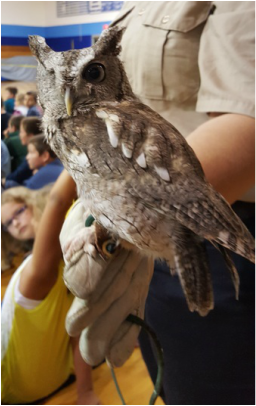 Yesterday, we had visitors from Binder Park Zoo. Meet Uno. I've never been a huge owl fan (real life owls) but Uno was pretty cool. I do not think she liked having her picture taken, but, as you can see, she is very photogenic. This gentle giant is Radar. 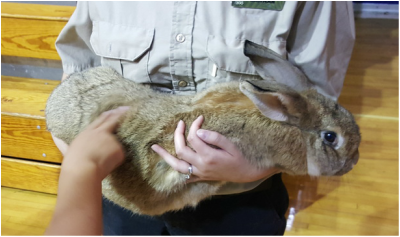 Students were allowed to gently pet him on the way out of the gym. Radar is only half grown and will probable be around 30 lbs. when full grown!